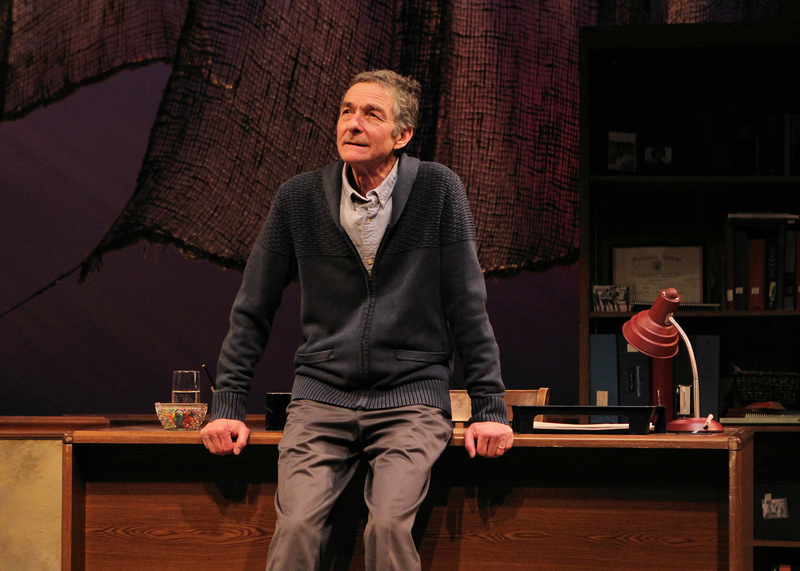 In the History Theatre’s latest production “The Things They Carried”, based on Tim O’Brien’s best selling book, recounts a young Minnesotan’s experiences during his time in Vietnam as well as before and since the war. This one man show featuring Stephen D’Ambrose as O’Brien brings us to the front lines and into the rice paddies as he vividly recounts what he saw and heard during this time. We also learn of O’Brien’s thoughts on the war before being drafted as well as in the 40 years since returning home. D’Ambrose is the perfect actor to bring this story to life. He has the energy and stage presence to fill the entire theatre for the full two hour show. As O’Brien is recounting the stories and making notes for the book he is writing you feel as though you are spying in on a writer in his office. However, the vivid details used to describe the stories quickly transports us to the rice paddies of Vietnam, a small lake resort in Northern Minnesota and to New Jersey among other locations. The staging is simple… a desk, office chair and some bookshelves, but that is okay. The stories and emotions being shared are powerful and make this production a first rate experience. Tim O’Brien’s book has been considered the quintessential book on the Vietnam experience and as the daughter of a Vietnam War veteran I found this show extremely interesting, informative and insightful. My dad never shared anything about his experiences over there with us, but I always imagined there was a reason. Like he was sparing us from the details of what he saw and experienced. After seeing this show I realized he was sheltering us from those realities. Or maybe, like many other veterans not sharing the details made it not real. This show is being presented in rep with the production Lonely Soilders: Women at War in Iraq. For more information on either show or to purchase tickets visit the History Theatre’s site.